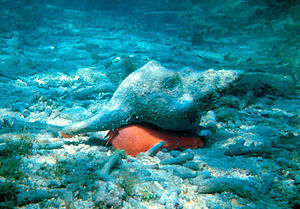 The Florida horse conch (Pleuroploca gigantea) seashell is the state shell. With all the seashells found along the many beaches in that state, do you ever wonder how they chose just one and why? Sorry, but I don’t know the answer – if I find out I’ll post it here – but I imagine because it is one of the largest gastropods in the world! My ID book says that the mollusk can grow up to 19 inches in length, but other sites have said up to 24 inches! They are carnivores and eat other large gastropods, such as the Murex, Lightning Whelk, Tulips, Oysters and others. They use their proboscis to eat the meat out of the shell of their prey. The “i love shelling” blog has a great photo of a smaller horse conch eating a lightning whelk, in the post entitled: Feeding Frenzy! Many states have also chosen a specific mollusk as their state shell. View the list here. Next Post Do Angels Shed Their Wings?